Monday, 16th Jan 2012. Stock index and index futures ended the week at high note but with less liquid most of the time as market does not oscillate much throughout the entire week. Other news to follow. "-The U.S. stock market faces the heart of the fourth-quarter earnings season in the week ahead, with the bar substantially lowered for coming results and Europe’s troubles in play. After a 159-point fall, the Dow Jones Industrial Average DJIA -0.39% recovered the bulk of its decline to end at 12,422.06, down 48.96 points, or 0.4%. Up three of the past four weeks, the blue-chip index on Friday tallied a 0.5% weekly rise. The S&P 500 SPX -0.50% fell 6.41 points, or 0.5%, to 1,289.09, up 0.9% for the week. The Nasdaq Composite COMP -0.52% shed 14.03 points, or 0.5%, to 2,710.67, up 1.4% from the prior Friday’s close." "-Most Asian markets rose on Friday as successful Italian and Spanish bond auctions and comments from the European Central Bank helped alleviate concerns about the region’s debt crisis. Mainland Chinese stocks, which tumbled after data showing a drop in fourth-quarter foreign exchange reserves, were a notable exception. Japan’s Nikkei Stock Average JP:NIK +1.34% jumped 1.4% to 8,500.02, South Korea’s Kospi KR:0100 +0.60% gained 0.6% to 1,875.68, Australia’s S&P/ASX 200 index AU:XJO +0.36% rose 0.4% to 4,195.90 and Hong Kong’s Hang Seng Index HK:HSI +0.57% gained 0.6% to 19,204.42. On mainland Chinese bourses, the Shanghai Composite Index CN:000001 -1.34% sank 1.3% to 2,244.58, while the Shenzhen Composite Index plunged 3.5% to 845.93." "- Crude-oil futures fell further under the $100-a-barrel mark on Friday, extending losses after talk of an Iranian oil embargo eased and as jitters over a prospective euro-zone debt downgrade attracted investors who bid up the U.S. dollar. February futures of light, sweet crude CL2G -0.07% settled lower by 40 cents, or 0.4%, at $98.70 a barrel on the New York Mercantile Exchange." "-Soy product futures tumbled with soybeans, fueled by improved South American crop prospects and ongoing global economic fears. Rains added to South American forecasts for next week are easing fears of supply constraints in 2012, and with traders leery of taking on risk heading into the weekend, buyers stepped away from the market, analysts say. CBOT March soymeal dropped $5.60 to $301.50/short ton; March soyoil fell 1.17c to 50.29c/lb. Soy product futures tumbled with soybeans, fueled by improved South American crop prospects and ongoing global economic fears. Rains added to South American forecasts for next week are easing fears of supply constraints in 2012, and with traders leery of taking on risk heading into the weekend, buyers stepped away from the market, analysts say. CBOT March soymeal dropped $5.60 to $301.50/short ton; March soyoil fell 1.17c to 50.29c/lb. " FKLI- Sideways Market Expected To Last Early After Chinese New Year, Upside Paused. Both Stock index and index futures ended on the yearly (2012) high previous week without the presence of volume as most of the market participants are prep for coming holiday break. There was just not enough movement in the market as both stock index and index futures just barely move within eight points range most the time. Both instrument barely move about 0.6% last week, which might lessen the likely hood of flurry rallies for Chinese New Year this week. With less major news in the market, this sideways condition could remain for the moment. Technically, the spot month contract upside break out is still pending as it cannot break through above previous high at 1,533 level, marking less follow thru Buying activities throughout the week. For this near term, traders could expect minor retracement due to U.S market overnight performance that ended in a weaker note. Weekly resistance remain around 1,535 level while weekly support is located around 1,500 level. FCPO- Break Down After Testing At The High For Few Sessions, More Weakness Eyed. CPO futures ended lower on weekly basis succumbing to Soya oil weakness due to higher than expected supplies estimated by USDA previous Friday. This news is going to badly effect palm oil sentiment that is currently recovering. Palm oil futures weakness is expected to extend substantially as Soya oil continues to sell-off last week, ending 2.4% lower to 50.19 cents, approaching 50 cents psychological support level. According to article Earth Policy Institute, "The world's farmers produced more grain in 2011 than ever before. Estimates from the U.S. Department of Agriculture show the global grain harvest coming in at 2,295 million tonnes, up 53 million tonnes from the previous record in 2009." Meanwhile for palm oil, production might be slow down after peaking last year but stocks level would not fall that quickly as there were high domestic inventories stored by China for upcoming Chinese New Year. 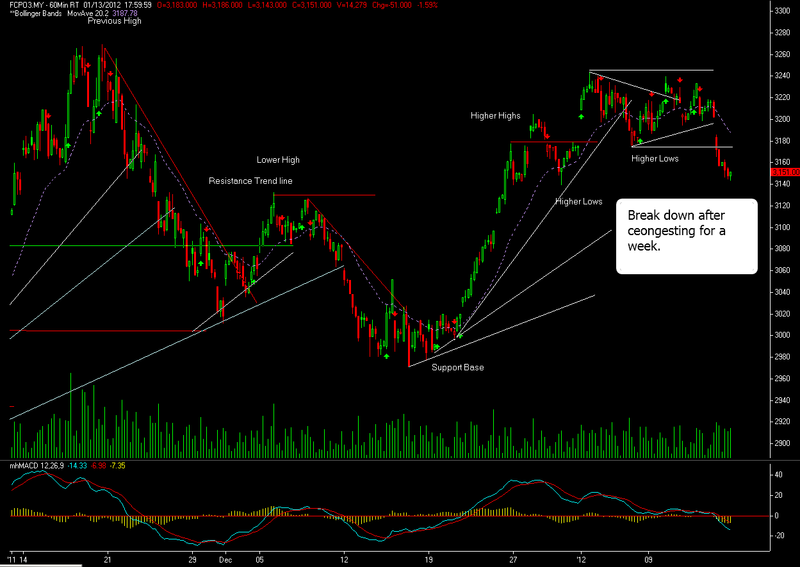 Technically, the benchmark Mar have break out from the range after congesting for a week. My initial assessment suggest that there is likely another round of sell-off as overnight Soya oil futures continue to tumble more than 2% plus record high palm oil stocks about 2.04 millions tons for 2011. Hard landing is expected for palm oil futures this week with small possibilities or no sight of market recovery yet. For today, psychological support is located around 3,000 while resistance is pegged at 3,177. 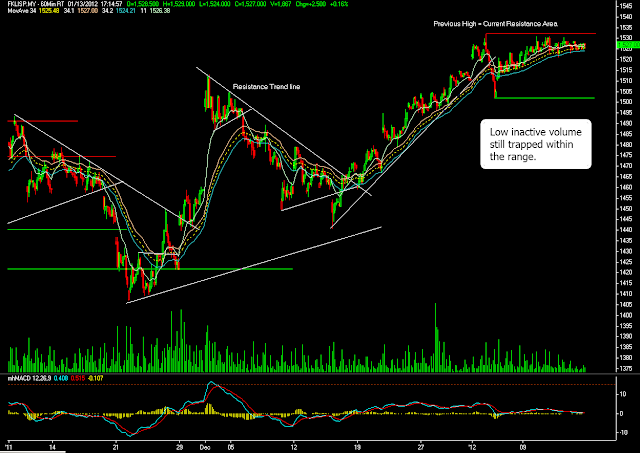 P/s: Gap down of 30 points is expected.